The New Mexico Off Highway Vehicle Alliance (NMOHVA) is proud to announce our early summer "multi-modal" event will be held in Grants, New Mexico on May 31 - June 2, 2019. Grants is a very motorized recreation-friendly community and offers outstanding recreational opportunities on nearby Mt. Taylor and in the Zuni Mountains that will be "new" to many of our members and the larger riding community. The event is only $50 and online registration is now available HERE. This is a “low-cost, low-frills” event open to dual sport motorcycles, ATV/UTVs, and 4x4 vehicles. The event is focused on providing outstanding trail opportunities to all users. The motorcycle and ATV/UTV portion of the event is AMA-sanctioned. Registration for the event includes dinner Saturday evening, an event T-Shirt, and event decals. All funds received above the cost of hosting the event will go directly to NMOHVA's Access Defense Fund. The Access Defense Fund is used to protect and preserve motorized recreation and access in New Mexico. All three days of the 7 Trails of Gold will feature mazing exploration on a variety of roads and motorized trails. Mount Taylor offers high altitude (11,000 foot plus!) alpine scenery, outstanding vistas, and unforgettable riding. The Zuni Mountains offer a rich logging, railroad, and mining history with many remaining relics and ruins amidst the pines, aspens, and lush green meadows. All riding is strictly "no fee" and at the event participant's discretion. Maps and/or GPS tracks of suggested routes will be provided and we anticipate plenty of people who would be willing to let others follow them as they explore the beautiful and varied scenery around Grants. 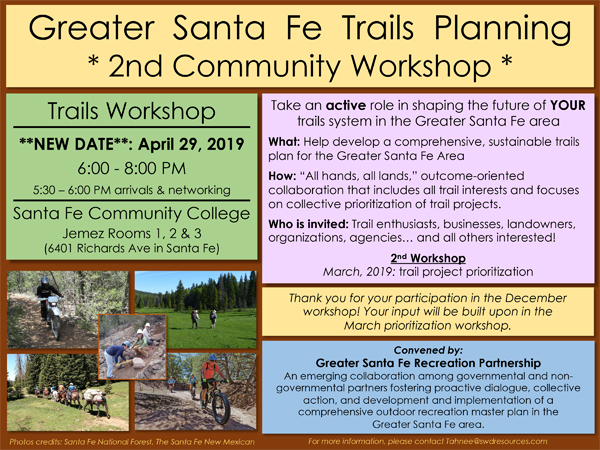 This NMOHVA event is being held in conjunction with Grants MainStreet Project 7 Trails of Gold Outdoor Festival. The festival highlights the wonderful trail-based recreation in the surrounding area. The festival will include live music, BBQ/food vendors, and local breweries offering their finest craft beers on Saturday at the Fire and Ice Park in downtown Grants. More details on the Grants MainStreet Project portion of the event can be found on Facebook HERE. 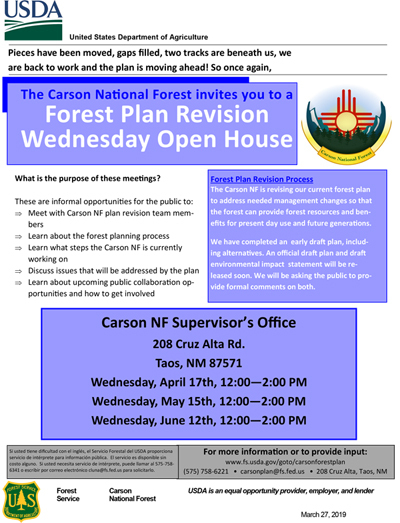 The Bureau of Land Management’s Taos Field Office invitesyou to review the preliminary route network alternatives; discuss and identify new recreational and access opportunities; and learn about implementation of the travel management plan. 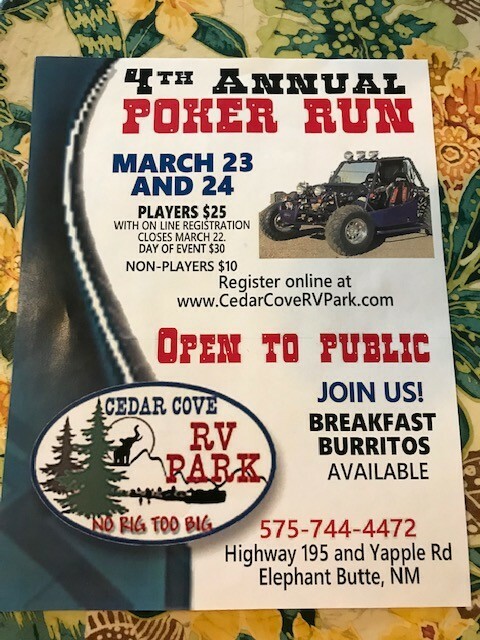 Wednesday, March 27, 2019 4-6:30 p.m.
03/23/2019 – 03/24/2019: 4th Annual Poker Run @ Cedar Cove RV Park- Open to Public!